Electronics have particularly short lifespan due to the rapid technological evolution that brings us even more, even better, even smarter devices. 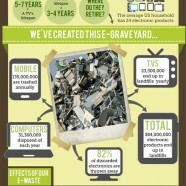 What is really worrying is the fact that hardly 18% of discarded e-waste ends up in proper recycling plants. Read some interesting stats about the environmental burden caused from careless electronic waste disposal and the value of recycling.